Trixie was suddenly furious. "My Lucy books are no dumber than those Cosmo McNaught science-fiction things you're always reading." "It's not the same thing at all," Mart drawled, cutting himself a huge wedge of pie. "Cosmo is a superlative writer, and moreover, he's not covered with adolescent zits." Trixie could feel the hot tears gathering behind her eyelids. She swallowed hard. I won't let Mart make me cry, she told herself. I just won't! All the same, she knew she was going to have to run to the blessed privacy of her own room - and soon. "I'm going to bed," she said abruptly. "And by the way, you needn't worry about tomorrow's arrangements, either of you. Dad, Moms, and the other Bob-Whites have already been told about the plans for the trip." "Thank you, 'Lucy' Belden -" Mart began. Reddy raised his head in sleepy outrage as Brian suddenly rose to his feet and shoved his chair roughly toward the table. "Sometimes, Mart," he said, "you go too far. And Trixie's right! I don't think that Lucy Radcliffe's Adventure in Paris is one bit sillier that Cosmo McNaught's Journey to the Crab Nebula." Mart flushed at the unaccustomed criticism from his older brother. "It's not the same thing at all," he mumbled. Trixie was already halfway out the door. But she was gratified to hear Brian add, "And one other thing, Mart - if I were you, I wouldn't be quite so quick to poke fun at Trixie's sudden hunches. If you think back, you'll realize they're usually right." Sleepyside, New York and Pirate's Point in the Catskills. The Bob-Whites plans to spend a few days at Finger Lakes with the Wheeler's are ruined when Mr Wheeler has to go away on business, so Miss Trask invites them to join her on a visit to her home in the Catskills. The Bob-Whites are tempted by the opportunity to solve the mystery of the disappearing Pirate captain, but Trixie finds other suspicious happenings occurring at the Inn. Ghostly Galleons, fires, mannequin wrestling and the disappearance of Miss Trask's brother present a major mystery for Trixie to solve before the mortgage on the Inn is foreclosed and the Trask family lose the Inn forever. Frank Trask - Miss Trask's brother and manager of the Inn. Nicholas Morgan and Smiley Jackson - worked together to try and ruin the Inn so Morgan would have the deeds and be able to sell to a Hotel Chain. This book is set in October and Honey and Trixie are 14, Brian and Jim are 17 and Mart is 15. Dan's age isn't mentioned, but he does go on this trip. 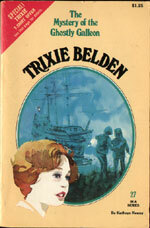 Mart and Trixie fight a lot through this book although they reach a truce by the end, which parallels Miss Trask's relationship with her brother. The Bob-Whites were supposed to fly to Finger Lakes in northern New York to a cottage owned by the Wheeler's on Owasco Lake, not far from Auburn (p. 16). Miss Trask 'had patiently arranged a wedding while the Bob-Whites were in the middle of searching for a missing heiress and solving mysteries around Glen Road' (p. 19). This could have been worded better, as the wedding was for the 'missing heiress'! Trixie reads Lucy Radcliffe novels and Mart reads Cosmo McNaught books, and it is suggested that the novels are autobiographical: 'Her name is Lucy Radcliffe. And she does not write dumb novels. She's only eighteen years old, but she's had so many wonderful adventures' (p. 28). 'Everyone knew that since Trixie had rescued Jim from his cruel stepfather, she could do no wrong as far as he was concerned' (p. 82). Di knows about loans and collateral and explains how it works to Trixie when she laments about not being able to ask her father, a banker, for advice (p. 124-125). Trixie must have forgotten all about loans and collateral from The Mystery Off Glen Road, when she used her diamond ring as collateral to hold Brian's car until they earned enough money to buy it.